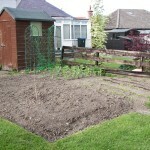 Our vegetable patch. Pea obelisks on the far side by the shed. Our peas will not come to much this year. Last year we had the best crop ever, but towards the end of the summer the pigeons discovered that they could sit on top of the obelisks we’re using for pea frames and gobble down the lovely tasty young pea shoots. And guess what? They’ve remembered. Obelisks = peas = food, and every bit of young pea seedling that is reachable around the pea net is being snaffled. Meanwhile, we’ve planted the rest of the bed with brassicae, and netted it all over because the pigeons will strip all the leaves of them too given half a chance. Of course, this makes it a hass to get in and weed, hoe, fertilise, decaterpillar, and generally maintain the ground and crops. So we think it would be a good idea to enclose the whole bed in a fruit cage. Now, the sort of fruit cage you can generally buy is a rather flimsy bamboo or aluminium frame draped with netting. It’s not terribly pretty, and it’s not terribly durable. Its big advantage is that you can easily move it from one part of the garden to another. 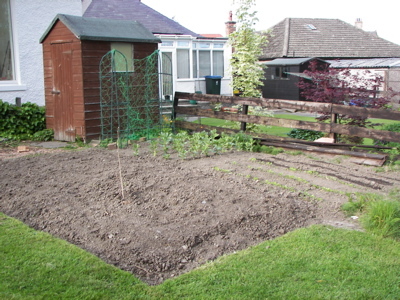 This isn’t a great advantage if you want to enclose your whole vegetable patch. We want something sturdy, and preferably pretty, since it will be the main view from the new studio. It also needs to be Pretty Damn Big. While looking for, and failing to find, a fruit cage that came anywhere close to meeting our criteria, we saw a number of posts on various fora about building your own fruit cage. At first we thought this was a non-starter. But then we realised we could get a rather nice-looking frame pre-made, by buying a pergola – or rather several, to fit the size of the vegetable patch. Then it’s just a matter of pinning chicken wire all over it, and shazam! a fruit cage! There’s a second part to the Cunning Plan. Those who’ve seen our garden know that this is only one of two vegetable patches. Half of the other is overgrown with what used to be a soft fruit bed (which we planted, more fool us) and now mainly contains invasive raspberries of mediocre flavour and a large growth of weeds. Soft fruit is very easy to come by in this part of the world, with lots of pick-your-owns where you can get much nicer raspberries than these. So we plan to take out all the remaining fruit and the weeds, and build a large greenhouse over this bed, replacing our current greenhouse which is too small to grow more than a few tomato plants. We want to grow grapes, peaches, aubergines, cucumbers, and maybe even watermelons. Of course, a greenhouse of the sort of size we’re looking for is costly. Come to think of it, pergolas aren’t that cheap either. I suppose we’ll just add it to the ever-lengthening list of improvements we’ll start saving for once the extension is complete.